Holmarc's Kerr effect apparatus (Model No: HO-ED-P-05A) is used to determine the Kerr constant of the Liquid (Nitro Benzene C6 H5 NO2 ). In this apparatus, Nitrobenzene is used as the Kerr agent because Nitrobenzene shows a large Kerr constant than other polar liquids. Multiple travel of laser beams through Kerr cell helps to make it compact. This apparatus helps students to acquire knowledge on the fundamental physical property, Kerr Effect. The Kerr effect, also called the quadratic electro-optic effect (QEO effect), is a change in the refractive index of a material in response to an applied electric field. 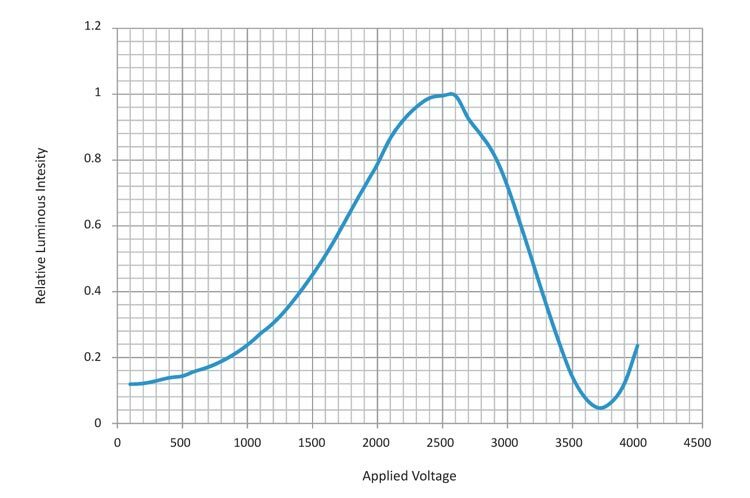 By plotting the square of the applied voltage versus the phase shift between normal and extraordinary beam it is to be shown that the relation between the two quantities is approximately linear. From the slope of the straight line the Kerr Constant is to be calculated. The phase-shift between the normal and the extra-ordinary light beam is to be recorded for different voltages applied to the Kerr cell respectively for different electric field strengths. 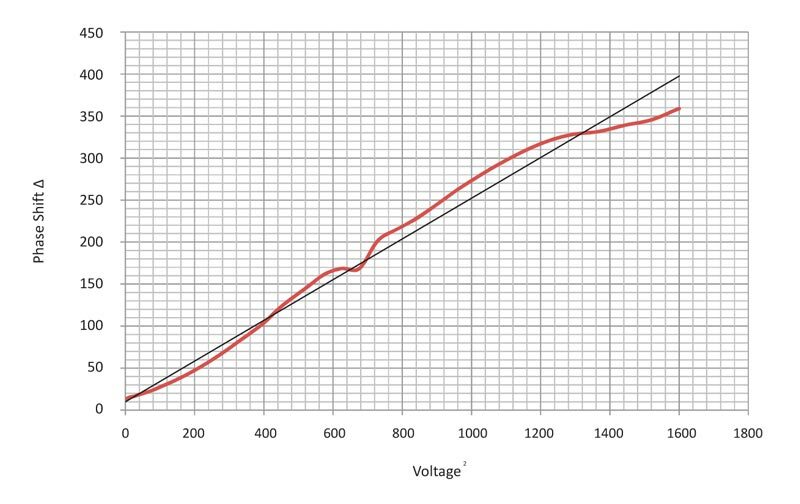 The half wave voltage is to be determined. In this apparatus, polarized light from a DPSS laser is directed to pass through the space between the electrodes of the Kerr cell. The beam is reflected by a mirror from the other side of the Kerr cell and again it passes through the space between the electrodes. 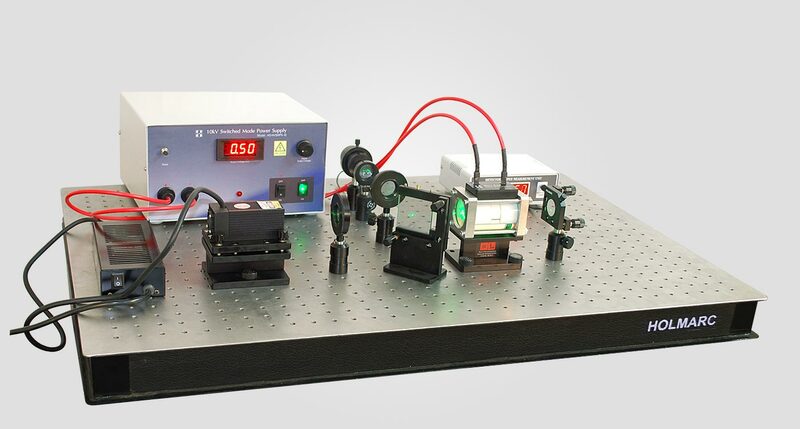 With the help of a beamsplitter and convex lens, the beam is directed to focus on a Si photo diode detector. 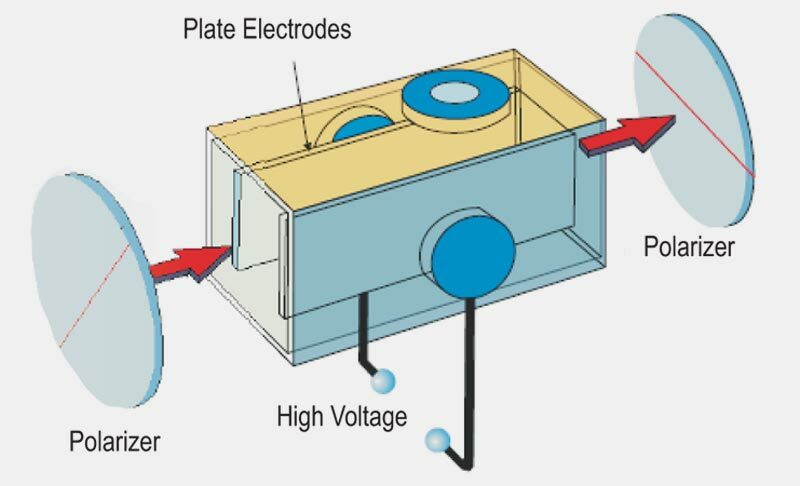 Embodiments of Kerr effect apparatus provide a phase-shift between the normal and the extra-ordinary light beam and it can be recorded for different voltages applied to the Kerr cell for different electric field strengths. Ours is an organisation dedicated for the design, development and manufacture of optics, opto-mechanics, educational products and positioning devices. We have in-house infrastructure capabilities for all the processes involved in the manufacture of our products. This helps us to have total control of quality in our products and services. Our core competency is in prototype development and low volume production of opto-mechanical devices and systems where skilled labour is the major input. Our location in INDIA enables us to be the most cost effective in this field of activity compared to any other company in the world. The products described in this website constitute only the standard items we manufacture for research and industrial market. One of our major activity is in OEM market where we develop and supply low volume opto-mechanical devices & positioning as per custom design. We also undertake contract manufacturing of opto-mechanical products in standard and custom specifications. We try improving the quality of our products for every consignment we dispatch. Our customers can expect to receive better products each time a purchase order is placed with us. Our strength is our satisfied customers worldwide. We request your continued support in our endeavor to serve you better. We thank you for taking time to visit our website and await for an opportunity to be at your service in near future. Kalamassery, Kochi - 683 503, Kerala, India. Purchase Orders: Written, faxed and e-mail purchase orders are accepted. All orders require immediate written confirmation. Product warranty: Our warranty for all our mechanical components and systems are ONE year from the date of shipment. Repair or replacement will be made free of charge for products with defects in material and workmanship during this period. For our optical components, our warranty is 30 days from the date of shipment. Defective items will be replaced free of cost. The customer must notify any defect in optical components within 48 hours of receipt. For all warranty replacement, a written statement with an authorized signature indicating the reason for rejection attaching test reports are requested to accompany the returned parts. All defective items must be returned in their original shipping container within 10 days of the date of shipment. Quotations: All quotations are valid for 90 days from the date of issue. Payment: 100% Advance payment prior to dispatch. Customers paying by international wire transfer must prepay all bank charges including all charges imposed by correspondent or intermediary banks. Shipping & Delivery: The shipping costs, Custom Duty and any (if) landing taxes etc will be extra. The date of delivery is only an estimate and we will have no liability for late or partial deliveries. we may refuse any order for any reason. Catalog items are normally shipped immediately from inventory. In the event that the items is out of stock, an estimated delivery date is given at the time of order. Most items can be shipped within 45 days. Installation: Onsite installation of our equipment's can be provided on buyer's account. Specifications: HOLMARC reserves the right to modify, change or otherwise improve all items in the catalog specifications without prior notice. Taxes: We collect general sales tax on shipments, unless the purchaser supplies us a signed official sales tax exemption certificate with the order. Purchase made outside our region are subject to state or local sales/ use tax, if any and other taxes payable by reason of this transaction. Repairs: If your unit is out of warranty but needs repair, please contact us with details regarding the damage. ©2018 Holmarc Opto-Mechatronics (P) Ltd. All rights reserved.